The British Embassy in Amman Jordan is listed below. If you are in need of consulate assistance then email the embassy in Amman or better yet give them a call if it is an emergency. 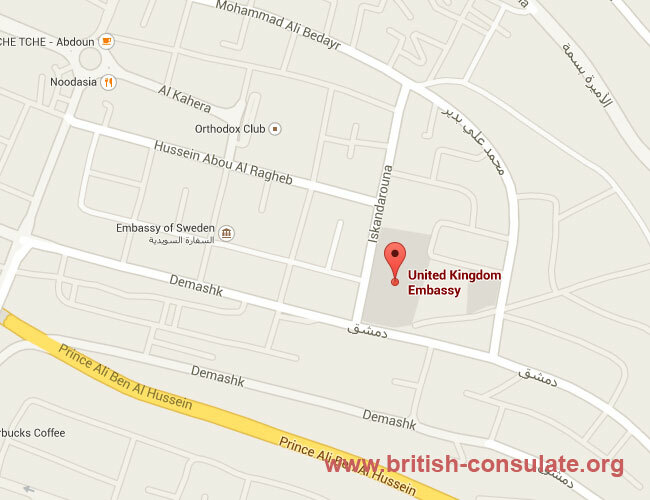 If you cannot reach the British Embassy in Amman by telephone then it is best to email them any of your questions. Considering the strife currently in the Middle East contact with the embassy by email would be much easier. Note that the British embassy in Amman is closed on Fridays however they are open on a Sunday. We have also included the visa stats for the embassy listed below if you are looking at applying for a British visa. These are the public holidays for Jordan. Note that these are not the British Embassy days as they have excluded Easter Friday, Easter Monday, Christmas and Boxing Day. Email the embassy before you go down to the embassy to ensure that they are open on the day on which you wish to visit them. The National Day in Jordan is also celebrated by the embassy so the embassy will be closed on those days. Note also that the embassy is closed on a Friday being a Muslim country in the Middle East. These are the stats for the Jordanian based British Embassy and their stats for issuing a British visa for a Jordanian. Times will vary depending on the type of visa you are apply for so ensure that you have all the documents needed and requested to ensure that there is no delay in obtaining a visa.On average in Jordan you will obtain a British visa within 30-40 days being on average the longest for a visitors visa for the UK. See the figure below for your visa.